← Was it uncool to cruise a guy’s house and spy on him. June 1, 1964, Sunday. Jannie doesn’t like Dave at all. Got up at 5 am to finish my term paper. My eyes are sunburned, so wore dark glasses to school. My sister Donna is real sick. She got a sore throat and it’s all pusy, probably from surfing. Hope I don’t peal. Stuck to my diet real good, until after dinner when I made the Saffron cupcakes. Daddy and I went bike riding to Fedco and got Donna a Beatle record, but it wasn’t the right one, so we brought it back. I didn’t go modeling, was too tired. Instead I laid in the sun. I itch so bad from the sunburn on my back. Dave might come to Fosters tomorrow. 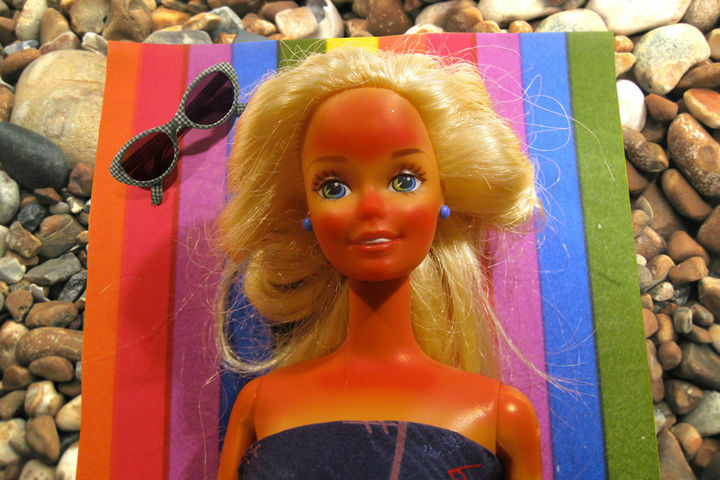 Summer vacation is almost here, so Saffron-Girl, Barbie, better get tan asap. I regret burning myself over and over throughout the years. Being tan was so important in California, with the beach only a few miles away. The worst thing was being a super white California Girl in a bikini. The Beatles and the Beach Boys ruled the music scene Summer of 1964. My sister Donna loved the Beatles, I loved the Beach Boys. This entry was posted in 1960's Surf Culture, 1964 High School Diary, Chick Secrets, diary, Little Sisters, Maybelline Girl, memoir, REALITY BLOG, Southern California 1964, teenage reality blog and tagged 1964, Barbie in a Bikini, Battle of the Bands, Beach, Beach Boys, Beach Boys Little Surfer Girl, Beatles, Beatles She Loves Me, Billy J. Kramer, breaking up, California, Capitol Records, Culver City, Culver High School, going steady, ITunes, Maybelline, Maybelline Story, Patricia Stevens Modeling School, Playa del Rey Los Angeles, Saffrons Rule, Sharrie Williams, Southern California, Strep Throat, Surfer's Rule, teenagers, Term paper, Universal Music Group, West Side Surfers, Westchester High School. Bookmark the permalink.